Nuclear medicine leverages the unique properties of isotopes and particles emitted by radioactive materials to produce images of biologic activity. PET, SPECT and scintigraphy equipment utilize gamma cameras to capture images that can indicate a tumor, fracture or other conditions. These images are generated by administering a short-lived isotope that is disproportionately absorbed by a patient’s biologically active tissue, as indicated by emitted radiation. Scintigraphy equipment forms a 2-dimensional image based on this radiation. It is used to diagnose a variety of conditions including gallbladder disease or obstructions, pulmonary emboli, fractured bones and types of tumors. The majority of nuclear medicine equipment is used in cardiology practices. Thallium stress tests are specialized scintigraphy scans. Thallium that has been injected is naturally transported into cardiac cells that have sufficient blood supply. The absence of thallium in specific areas of the heart either prior to or following strenuous activity may indicate coronary artery disease. PET and SPECT both generate 3D images based on molecular activity from by radioisotopes. SPECT/CT equipment combines a gamma camera with dual detector heads with a CT scanner to generate data that can be reconstructed in a variety of planes. SPECT equipment is less powerful than PET, but less costly as well. PET, an abbreviation of positron emission tomography, detects and images metabolic uptake. Patients undergoing a PET scan are given a solution of glucose combined with a short-lived positron-emitting isotope a short time before the scan. Tumors, metastases or infections that feature heightened metabolic utilization of the glucose are clearly detected by the PET, due to the coincidence of the isotope with the glucose. PETs that are combined with a CT or even a MRI produce hybrid functional and anatomic images. Recently, SPECT/CT and PET/CT systems have begun to be used for functional brain imaging as well as for diagnosis of cardiovascular disease, infections and cancer. 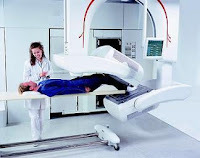 Siemens, Philips and GE are the most active vendors of new nuclear medicine equipment. Many Gamma cameras integrated nuclear medicine equipment for cardiac applications are produced by Danish Diagnostic Development A/S.